Numerous reform movements to improve society sprang up in the United States in the first half of the nineteenth century. The temperance movement attracted reformers who identified excessive drinking as the principal cause of domestic violence, poverty, and the general breakdown of morality. 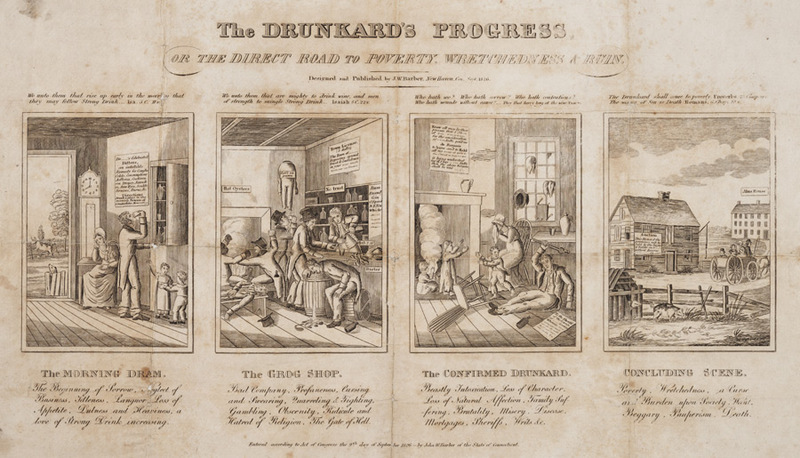 This broadside by John W. Barber, "The Drunkard’s Progress, or the Direct Road to Poverty, Wretchedness & Ruin," was published in 1826 to be displayed in homes, shops, and public spaces to remind people about the dangers of drinking. Inspired by the cautionary engravings "A Harlot’s Progress" and "A Rake’s Progress" by the English artist William Hogarth (1697–1764), "The Drunkard’s Progress" shows four scenes of an alcoholic’s path to ruin: "The Morning Dram," "The Grog Shop," "The Confirmed Drunkard," and "Concluding Scene." Each scene is paired with a Bible verse and a description of the damage accompanying escalating levels of vice, from "The Beginning of Sorrow, Neglect of Business" through "Poverty, Wretchedness, . . . Beggary, Pauperism, Death" as the home is auctioned off and the family is driven to the alms house. A pdf of the print is available here. Read the introduction and study the broadside. Then answer the following questions based on the text and images and your knowledge of American history. What is the tone and purpose of the broadside? How do the Biblical passages at the top of each panel relate to the images? What is the outcome of drinking as depicted in each of the four illustrations? Analyze the panels and be specific in your response. (“The Morning Dram”) and 3 (“The Confirmed Drunkard”). What changes take place within the drunkard’s home? Study “The Grog Shop” panel. In what ways are the denizens of the shop manifesting the behaviors in the caption? Write a one-sentence summary of the action in each of the four panels.